The summer Olympic Games, kicking off today in Rio de Janeiro, marks the 120th anniversary of the first modern Olympics held in 1896 in Athens. 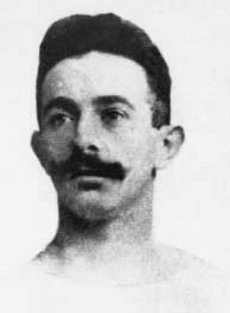 It is also the 120th anniversary of the first Olympic gold medal won by a Jewish athlete, Alfred Flatow. Born in Gdansk, Poland in 1869, Alfred Flatow represented Germany in the gymnastics competition. Flatow won gold in the parallel bars and the team competition, as well as taking the silver medal in the horizontal bar. Alfred lived in Germany after his Olympic career, but when Hitler rose to power, Alfred was sent to Theresienstadt concentration camp where he died in 1942. While Jewish athletes have garnered their fair share of medals (347 total) Israel has only seven. Although the nation of Israel officially formed in 1948, the Palestine National Olympic Community has represented the “Jewish National Home” since 1934. Israel sent its first athletes to compete in the Olympics in 1952. 25 athletes competed across five events but failed to take home a medal. It wasn’t until 1992 in Barcelona that Israel claimed its first Olympic medals thanks to judoka Yael Arad and Oren Smadja. Arad won the silver in women’s half middleweight judo, and Smadja the men’s lightweight classification. This iteration of the summer Olympic Games gives Israel its best shot at another Olympic gold; its first and only gold medal was won by Gal Fridman in 2004 for men’s sailing. Fridman has two of Israel’s seven Olympic medals, winning his first in Atlanta in 1996. But this time around it is the women’s turn for glory as the rhythmic gymnastics team looks to double up on gold medals from the 2016 European Championships, held in Israel in June, and most recently the World Cup in Azerbaijan. You probably don’t follow the Israeli rhythmic gymnastics team, but they rival any excitement found elsewhere in the world of sports. The five teammates Alona Koshevatskiy, Ekaterina Levina, Karina Lykhvar, Ida Mayrin, and Yuval Filo are all competing in their first Olympics. The five gymnasts have an average age of 18. The oldest, Ekaterina Levina, is 19 years old. The youngest, Karina Lykhvar, is just 17. The gold medal at the European Championships was a first for the nation, won in the “clubs and hoops” category. Israel also took home a silver medal in the ribbons competition, and a bronze in the all-around. At the World Cup, the team won gold in ribbons and placed fourth in clubs and hoops, which was good enough for second overall, behind world number ones, Russia. Just two weeks prior to the World Cup, head coach Ira Vigdorchik reportedly kicked gymnast Ekaterina Levina in training. On top of the kicking, Vigdorchik was accused of being both verbally and physically abusive to the girls, as well as drinking during practices and competitions. In spite of the accusations, a committee put together by the Israeli Gymnastics Association determined that Vigdorchik would remain the head coach of the team if by name only; two coaches and a choreographer will continue to physically coach the girls in the gym. It is likely that Vigdorchik was allowed to stay on as head coach only because of the proximity to the Olympics. Israel has some stiff competition for the gold medal, particularly from other European countries, with Russia competing as the favorite. The Russian team placed first in the all-around at the European Championships and World Cup. Following the International Olympic Committee’s ruling to disallow a blanket ban of Russian athletes, the rhythmic gymnastics team has (so far) escaped individual punishments handed out to athletes. Only the all-around competition is awarded a medal for team rhythmic gymnastics, so it is all or nothing for Israel. The rhythmic gymnastics competition kicks off August 19th and concludes on the final day of the Olympics on the 21st. Watch the group qualifications live on USA Network, Saturday at 9:00AM (EST) and the finals Sunday, live on NBC at 11:00AM. Still not excited enough? Check out Israel’s gold medal routine from the European Championships below and tell yourself you can do anything these women can.